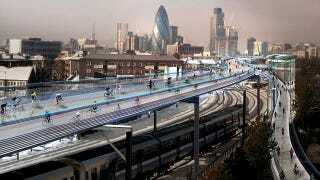 The idea, should it ever be allowed, approved, funded and built, is to create a 136-mile network of elevated cycle routes spanning the city of London, accessed through various slipway ramps, that would begin with a first phase linking east London to Liverpool Street Station. The cost for this aerial bike lane would be around $300m, which is the sort of loose change that ought to easily be dug out from the back of various governmental sofas. If it gets the go-ahead, the network would take 20 years to complete, and then our cyclists and drivers could both go their separate ways and stop punching each other in the face at junctions.